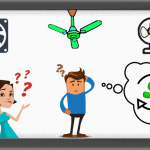 Home » Information » What Uses More Electricity: AC Or A Fan? See What I Found Out! Yes, air conditioners are wonderful for cooling a room. I recently purchased one myself to get relief from the hot Georgia summer here. It was unbearable at times! However, just like you I was curious about what uses more electricity – AC or a fan? I wanted to know not only which uses more but by how much. So I decided to do real-world measurements and show you which of the two draws the most power. I was blown away by what I discovered! Read on and I’ll tell you everything you need to know. 7. Summary: AC vs fans – which uses less electricity? Have you tried figuring out power specifications for air conditioners or fans? If so, you have my sympathy! It’s often a pointless, time-wasting, and confusing process. Even worse, if you find listed specs they’re often not correct. I decided to find out for myself what I was dealing with. Unfortunately when searching for power consumption data from manufacturers you’ll find it’s either totally unavailable or somewhat incorrect (based on theoretical estimates). I don’t want to rely on estimates. It’s rather frustrating to find out that very few, if any, air cooling product manufacturers offer decent specifications. Most have little to none available in my research. In fact of the ones that do provide any, often it’s only for the maximum (high-speed) settings. Lower speed settings such as low and medium had no specifications available at all! In order to figure it all out and give you the best and most helpful information I decided to take a hands-on approach. 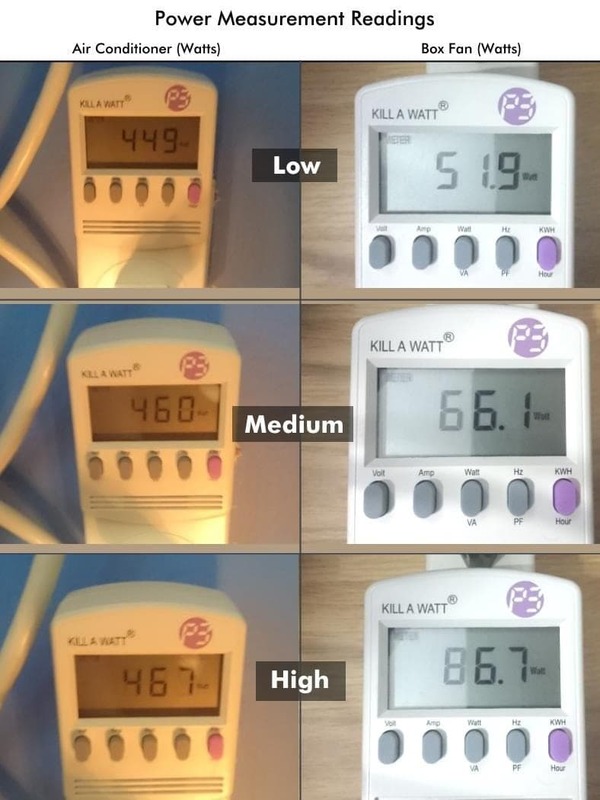 I measured and compared the power consumption of an air conditioner and a fan that I own. They’re good, typical examples of what many people would buy and are a great reference point. For test purposes I made power measurements using 2 typical products which are good examples. 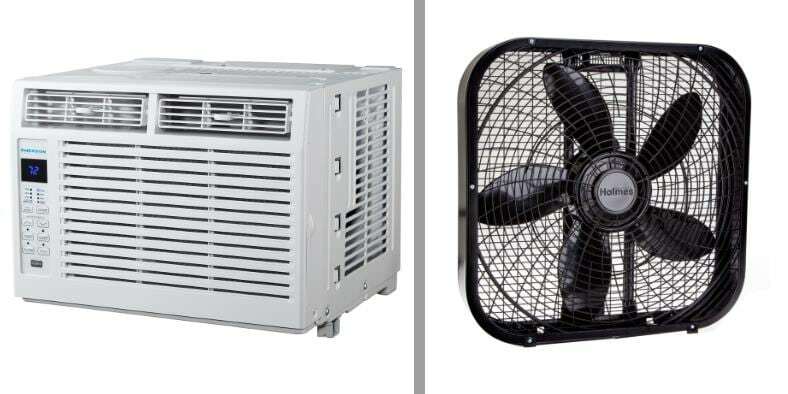 (Left) A 5,000 BTU (small room) budget AC unit, the Emerson Quiet Kool window air conditioner and (right) a typical box fan, the Holmes HBF2001DP 20 inch fan. Both are good choices as they’re popular and fit the price range many people shop in. They’re also around the same electrical power usage as many other similar products on the market. In order to get real-world data I knew it was important to measure power and collect data from real products in use. What better way than with 2 of my own air cooling products that very much like the ones you might use? Therefore I measured electricity used from both my air conditioner and fan for a variety of power and speed settings. To make it simple for you to see what it all means, I’ve provided a clear comparison graph and a measurement table as well below. Rather than guess or rely on questionable manufacturer’s specifications, I used this inexpensive little energy meter from Amazon to check power consumption. Using the meter I was able to record accurate and reliable data to compare AC and fan power use. I compared electricity used by recording measurements from this amazing little Kill-A-Watt P4400 energy meter I picked up from Amazon. 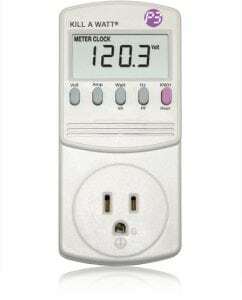 It’s accurate to 2% and is fantastic for monitoring a variety of power supply details including wattage being consumed during use. In the image I’ve provided below you can see for yourself the measurements I took when testing. There’s an amazing amount of difference between the two! I’ll cover this more in detail later. From top to bottom: Low, medium, and high settings I measured for power readings. You can see here the power use I observed for the air conditioner (left) and the box fan (right), measured in Watts. Notice how much more electricity the AC unit requires to run when cooling even when on low speed! I already had suspected that an air conditioner would draw more electricity to work that a standard ceiling or box fan, but I wasn’t ready for what I discovered! As you can see below, not only does an AC unit use more electricity, but it requires a huge amount of power compared to a fan. Even when the cooling mode (compressor) isn’t in operation it’s at least almost the same power requirement as a fan on low speed. Don’t worry, it’s actually quite simple! I just want to be sure there’s no confusion about what the numbers mean. I measured and recorded data for these settings for comparison in the table you see below. “Fan only” means the air conditioner is only powering the fan and isn’t actually cooling the air. While that’s a feature on many air conditioners, it’s not typically used often. However, I measured the power consumption for those modes as well for reference purposes. I was dying to know more about how much power the air conditioner would draw when not cooling. 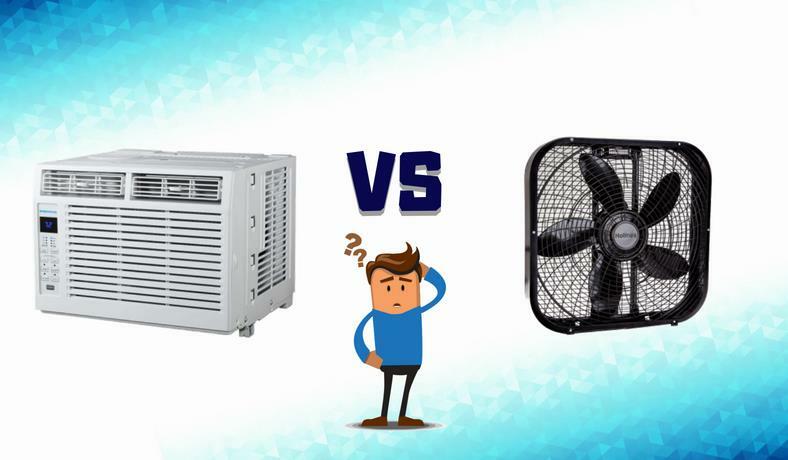 The most important values are at the bottom: these are a comparison of the low, medium, and high cooling settings used on both a fan and AC unit. Those are what you should look at when comparing the two. (Note: “N/A” means not applicable, as a standard fan only has speeds to choose from as opposed to “cool” and “fan only” modes like an air conditioner). 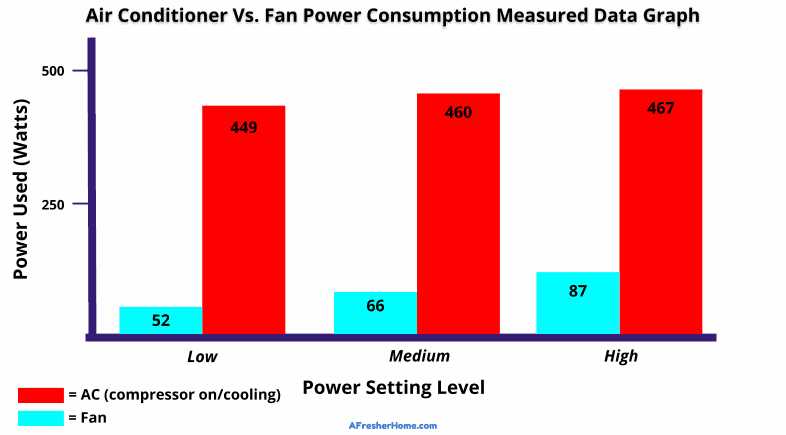 As you can see in the graph, for similar settings an air conditioner uses a TREMENDOUS amount of electricity vs a fan. So much so that even when the AC unit’s fan is set to low there’s very little benefit – the power draw is within a few watts or so still. You can see how much more efficient a fan is than an air conditioner using my data here. I was blown away with what I measured! What I discovered from my testing is that not only do air conditioners (yes, it’s very obvious!) use more electricity than fans, but they can use nearly 9 to 10 times as much as a fan does! That can mean a very significant impact on your electric bill. What really surprised me was how much an air conditioner uses when it’s on the low setting. It was only a few watts below medium or high! 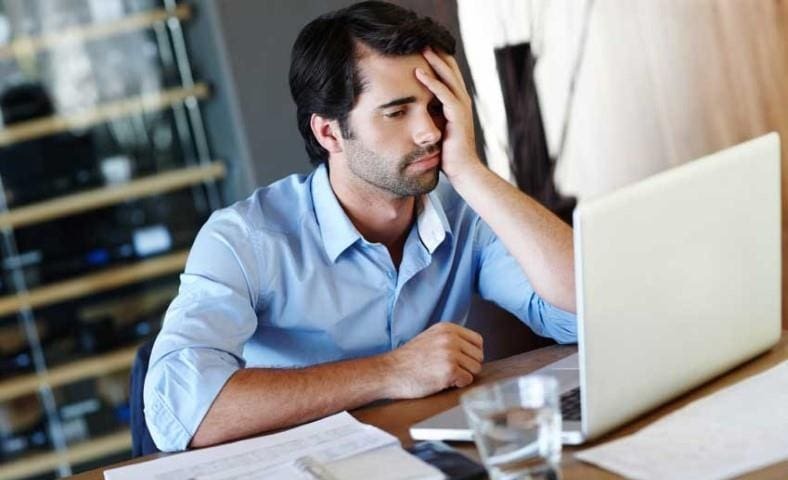 Although air conditioners do have a “fan only” mode, in most cases it’s simply not helpful to cool you and your room like a traditional fan can. That’s because (1) the built-in fan has a lower airflow rate than those you buy and (2) they can’t be adjusted to blow air directly where it’s needed for effective cooling. In the real world, an air conditioner needs to be left in the cool mode in which the compressor is in use. Because a compressor is essentially a motor-driven pump, it requires a substantial amount of power to work and produce cold air. That’s why air conditioners need so much electricity: they use a compressor to move pressurized refrigerant. This requires a large amount of mechanical force and therefore a substantial amount of energy. In fact the same can be seen with automobiles: using the air conditioner requires the engine to do more work and will increase fuel consumption substantially. Indoor air conditioners work by circulating refrigerant which, when forced through an expansion valve, creates a temperature drop that is used to blow cold air into the room. The room’s warm air is pulled out through the front panel and released into the outside. Fans are used to blow cold air into the room as well as blow the warm air from the condenser into the outside atmosphere. 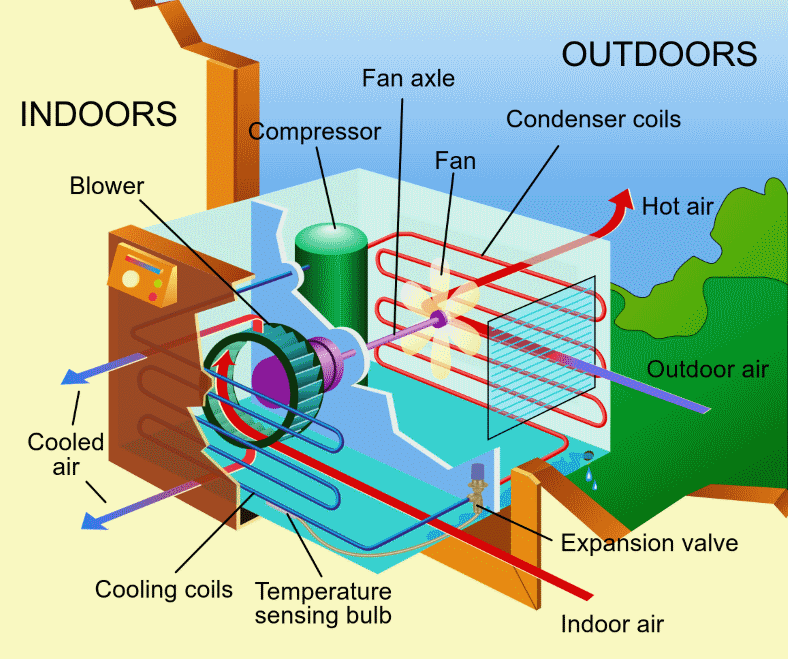 Air conditioners work using some amazing – yet extremely important – principles of physics. When a high pressure liquid (in this case refrigerant circulated under pressure from the AC unit’s compressor) is forced through an expansion valve a large temperature drop occurs. This temperature drop results in a cold refrigerant side which is piped through a section called a condenser. A high-speed fan, commonly called a blower, then blows cold air into the room. The existing warm air in a room is also drawn out it and forced out into the atmosphere outdoors. Unfortunately it takes a lot of electrical energy to drive the motor which turns the compressor which circulates refrigerant. That’s a downfall that comes with using an air conditioner. Did you know? Fans don’t actually cool the air. They work by blowing across surfaces and removing heat into the nearby air, causing a temperature drop and a sensation of cooling. Because they don’t need any heavy electromechanical devices like air conditioners use, they’re much more efficient in terms of electricity use. Note that certain fans are better than others depending upon your needs. 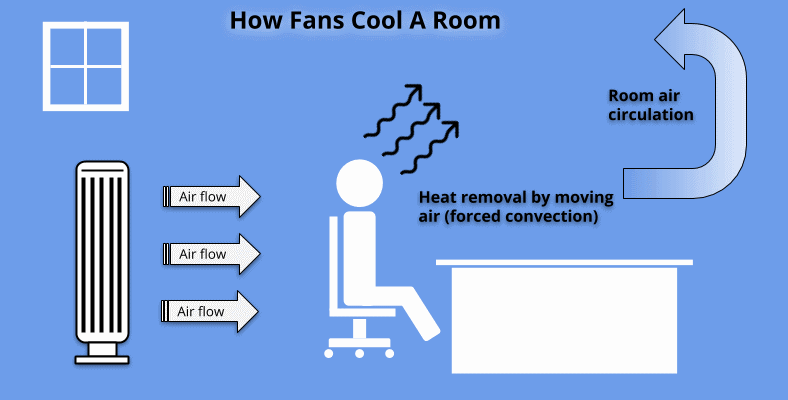 You might not be aware of it, but fans don’t actually cool you by blowing cool air. In fact, fans aren’t designed to drop the temperature of the air around you at all. Instead, they rely on the concept of forced convection. Does that sound like a strange or somewhat complicated concept? Don’t worry – it’s not. It simply means that forced convection cooling relies on moving air across your body and other surfaces in a room to move heat away into the surrounding air. By doing so, the temperature is effectively reduced and you feel cooler. Additionally, fans (depending upon the type, design, and features) can keep the air in a room continuously circulating which will prevent heat from building up. Because of how they work, fans have to be pointed at the surfaces you want to cool (like you!) to be effective. They also will need to run continuously to do so. Once they’re shut off, the cooling effect will be absent since there’s nothing to transfer heat away from you. Fans that have an oscillation feature are especially effective because they can continuously move automatically and blow air within a wide area in a room. Tower fans are especially helpful this way and are very energy-efficient, too. Tower fans are a unique style of cooling fan. Because of their tall design they’re good cooling fans and provide a nice “wall” of soothing air in a room. Most use an oscillating feature to cover a very large area with circulating air for optimal cooling. Many also provide additional advanced features that more basic fans don’t. For home cooling purposes, I recommend a tower fan. The’re especially well-suited for cooling you and your room because of their design. Unlike traditional fans, they have a rotary fan blade design which has a very tall shape. When running they produce a very tall vertical area of air that’s great for cooling. Additionally, most feature oscillation movement which allows them to blow a wide area of air within a room. 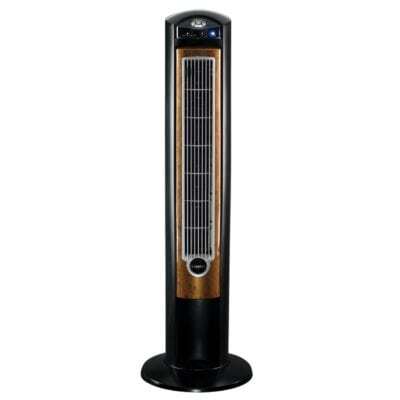 Unlike standard circular or pedestal fans they’re often much better suited for keeping you comfortable. You can find some of the best tower fans for cooling a room here. Summary: AC vs fans – which uses less electricity? An air conditioner uses at least about 9 times as much electricity as a fan. While the amount may vary from model to model, this rule holds true for all of them. Do you have questions, comments, or suggestions regarding fans, air conditioners, or anything related? I’d love to hear from you. Just post a comment below or reach out to me via my Contact page. Very well explained been looking for information like this. Iv suspected the AC was much more expensive to run than a fan but on this island the summer heat and humity are horrid so a AC combined with a fan are very effective in order to have a decent nights sleep. Thanks. Hi there Joe and thank you! I’m happy you found this helpful, as I definitely wanted it to be helpful to anyone who needed to know the facts.